Why choose a day surgery? Welcome to our website, we trust that the information provided is helpful in your treatment. Our mission is to ensure continuous improvement in the safety and quality of care to patients attending same day surgical services. Our modern, well equipped facility and our highly trained and caring staff help ensure that your stay at Liverpool Day Surgery meets your expectations. IBS is often mistaken for Inflammatory Bowel Disease which includes conditions such as Ulcerative Colitis and Crohn’s Disease. People diagnosed with IBS often have sensitive bowels and can therefore be more prone to the symptoms listed above. This occurs more frequently in females and can often be worse just before a period starts. Although the exact cause of IBS is not known, it is recommended that you start to notice any foods that may bring on abdominal or stomach discomfort. Including foods that have high fibre content can assist in decreasing the incidence of constipation. Limiting the amount of alcohol consumption may provide relief as well as drinking 8 glasses of water per day. Introducing gentle exercise especially if your lifestyle is more sedentary is recommended as this can alleviate the frequency of constipation. Some medications (anti biotics) may trigger IBS symptoms as well as they may react with the stomach causing diarrhoea. Stress levels can make some symptoms worse as well, so exercise and stress management are recommended lifestyle changes to make. Although there is no cure, discussing a tailored treatment plan with your doctor and dietician can give you a strong chance in managing symptoms with or without medications. You may find that you only need codeine based medications if you are managing stronger levels of pain. Tricyclic anti-depressants could be of benefit but will need to be trialled and closely monitored as well. Although discomfort in our bowels and stomachs may occur for different reasons, always check with a GP, a dietician and even a nutritionist for a more thorough round of assessment of your diet and testing, via blood tests to start with. Its a 10 out of 10 for LDS! 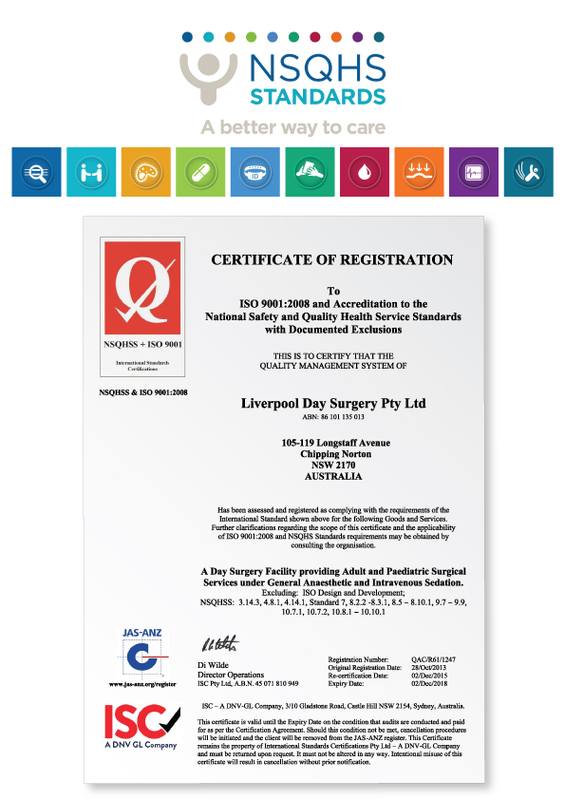 Liverpool Day Surgery is very proud to announce that, following an intense three day audit, we are now fully certified against all 10 National Safety and Quality Health Service Standards (NSQHS) as assessed by International Standards Certifications (ISC) and in the process, successfully renewed our ISO 9001:2008 certification with nil recommendations.